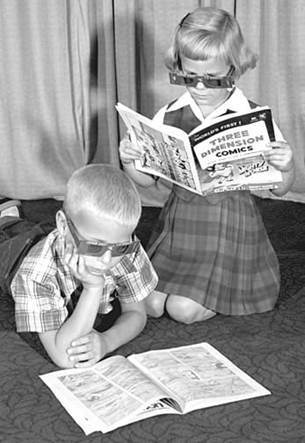 Germany, September 24, 1953: Jim and Ann Penn, children of Maj. and Mrs. Frank A. Penn of Bad Kreuznach, look over some of the first 3-D comic books to arrive in Europe. This photo itself appeared in 3-D on the front of Stripes' feature section; special glasses were included with that day's paper to view it and other 3-D photos. Readers were instructed to "assemble the glasses so that the red filter covers the left eye. The paper should be held at arm's length in a bright light. It may take several seconds for you to get the effect, and the illusion will improve the longer you look. If you have any difficulty fusing the superimposed images, try moving the paper toward you and away from you until the two images become one, then return slowly to the normal viewing distance." For an explanation of why 3-D has only caught on sporadically over the years, re-read the instructions above.